- Perhaps Friday, April 5th (Kentucky’s official Arbor Day) 11am-2pm? - Potential involvement of Campus Housing/Green House/Sustainability Living-Learning Community? - Potential involvement of KY and/or Metro Louisville Divisions of Forestry? - Tree give-away? 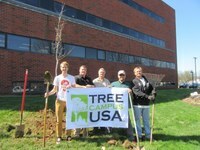 Tree plantings?